It was ridiculously cold this day. I was triple layered plus a jacket, gloves that have kept me warm before, but fingers and toes were freezing very quickly. I think I'll need mittens on top of gloves next time, and wool socks on top of the two pair I already had on. We had a very nice turnout. 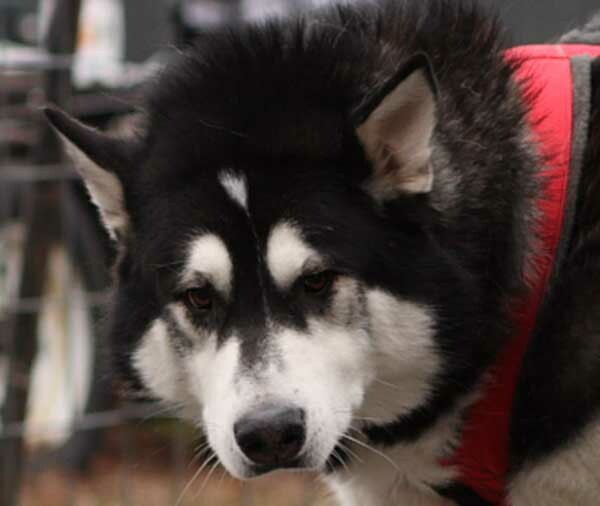 12 in the novice class, including a malamute (Nanook) I met at the demo I did at Tails on the Tundra. By my estimate we had 30 pulling pro. Lots of fuzzy dogs! Kari was there with her Sibes, 5, I believe. 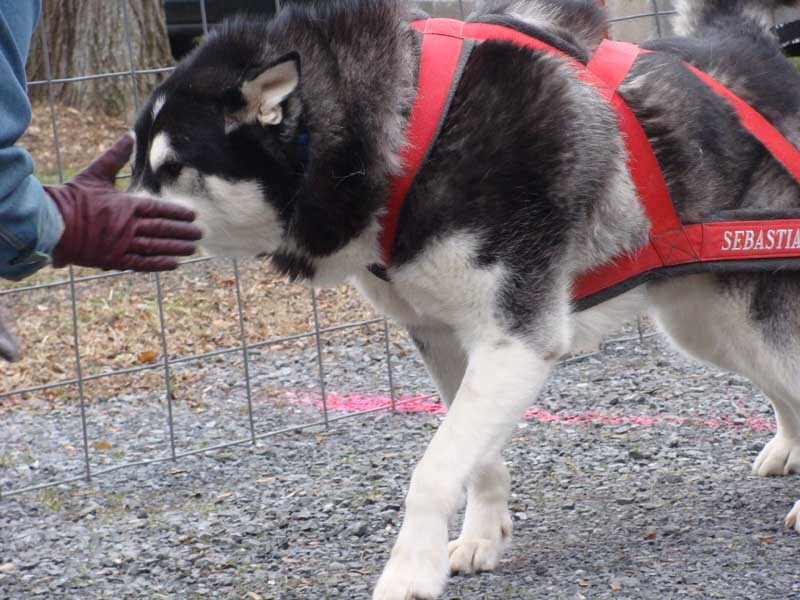 Brenda and Val were there with Raider and Tici (sp) and Shasta (who didn't pull, just accepted all attention). Barb and Jen were there with Bee Gee and Princess. Missy had Homer, and of course my two boys. 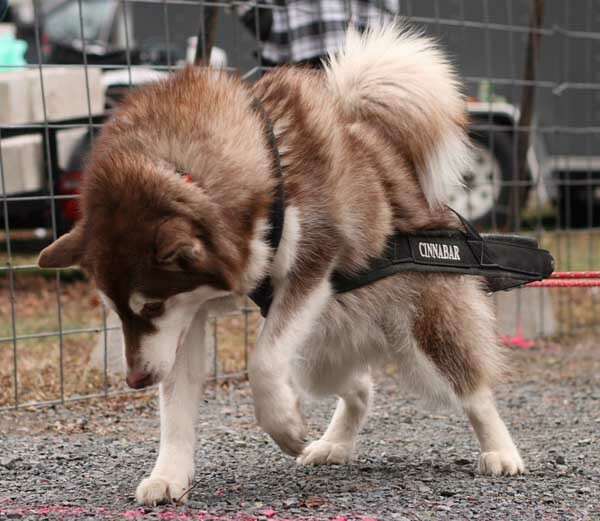 Two gentleman drove down from Connecticut to watch the pull and meet malamutes. The one cared for a mal as a kid and has been wanting one, but wanted to get more information as he's got a young child. He picked the right day, because there were a nice variety of mals for him to meet. 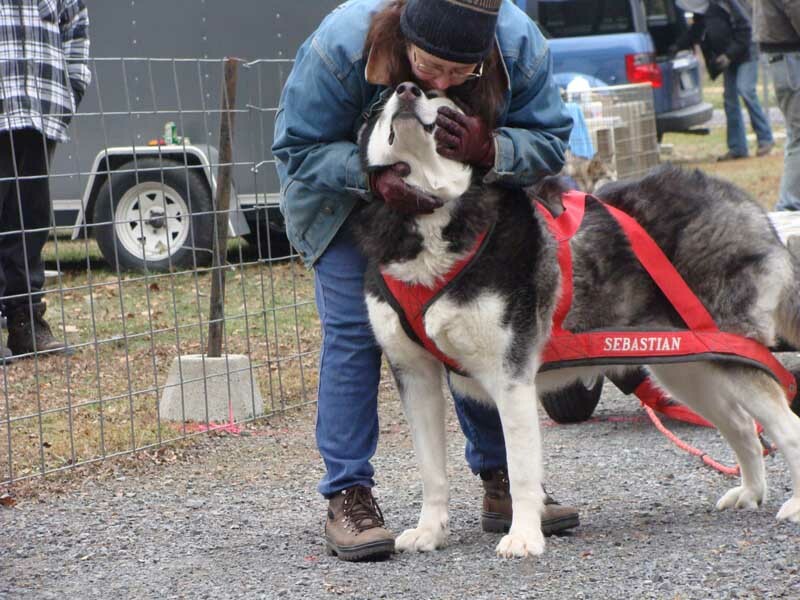 I got to meet him very quickly when he was pointing to Cinnabar's crate, calling him by name. He knew him by my site and Hudson's. 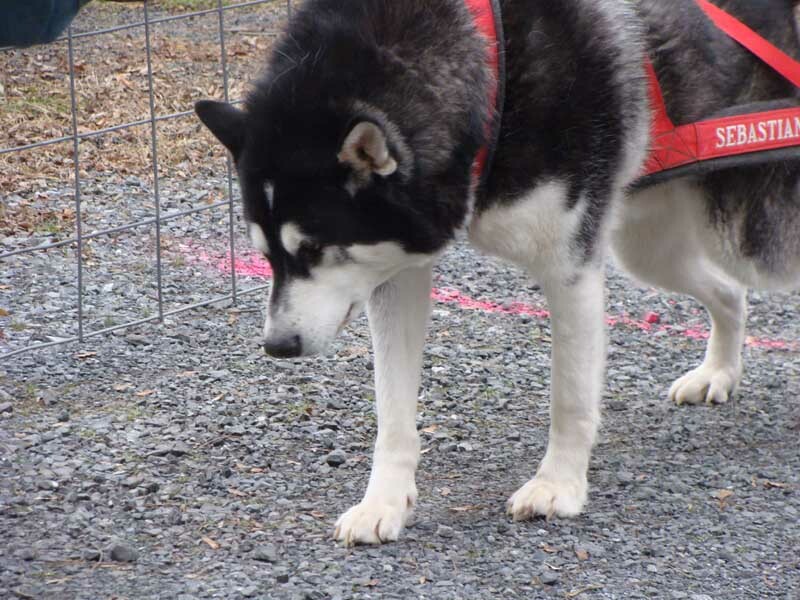 He "knew" their grandpa, Rebel, from Cascade's site, and their dad, Thumper, from Hudson's :) He got to spend time with a whole bunch of malamutes and malamute people and got the info their temperament as well as on their prey drive. He also very nicely took photos for me of my boys when they were pulling. Because of all the rain during the week, the ball field wasn't suitable. We pulled on the gravel fire lane next to the pavilion. Whew, this was a tough track! I took photos of the novice and 20 to 40lb classes which pulled together. Only the first round and 3rd round because I was near the river and it was even colder there. I had to thaw out in between classes in the car. Missy's oldest son pulled Hugger and did a great job. He made a decision on about her 5th round to go in and correct her. 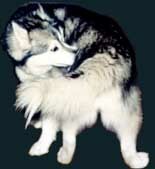 It was absolutely the proper decision and he corrected her with a tug on her collar just the way that Missy would. She immediately pulled for him. We all applauded, he's about 7 or 8 and did just a great job. 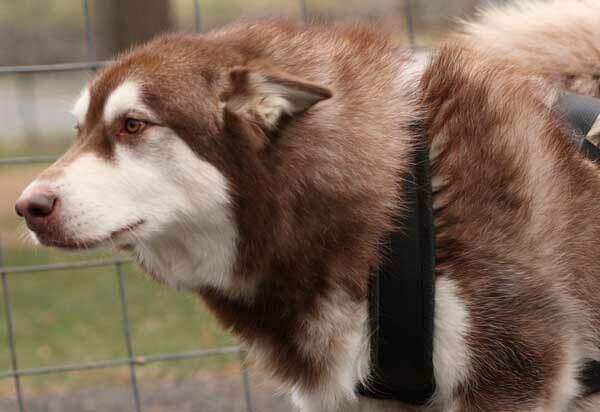 Of course the joke was that he outpulled his mom, because Dyna didn't make it past the second round :) She was just having one of those days and immediately barked and wouldn't pull. Not like her at all. One of my agility classmates pulled in novice with her beagle and dalmation. They both did well for their second time in harness (they pulled novice in Barto), and for the conditions. 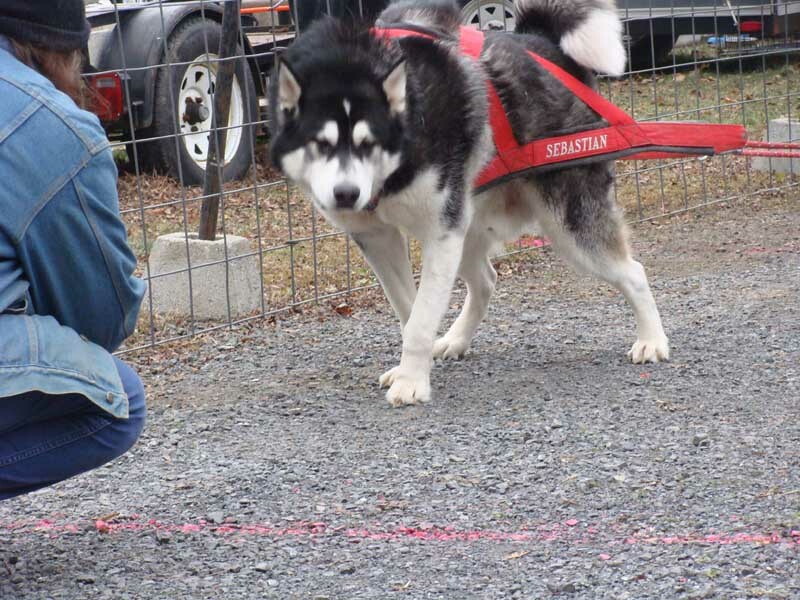 The mal, Nanook, pulling novice also did well, and his mom says we should see him at the next pull and is interested in Harrisburg and possibly Gettysburg. Super coolness!! The 60 through 150 lb class pulled together with 150lb increments. 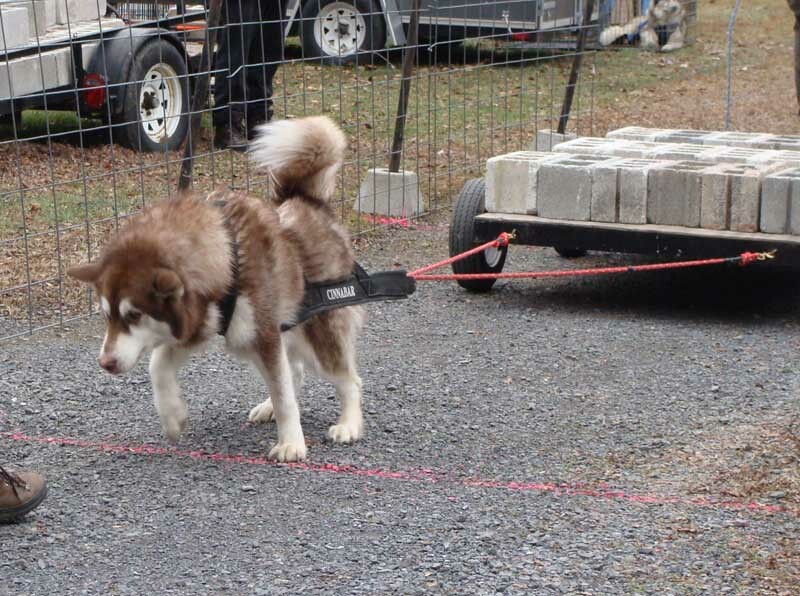 I knew that the little dogs had some trouble starting the cart in the gravel, but didn't think it would be as tough for the bigger dogs, so I started Sebastian at 750lbs and Cinnabar at 900lbs, so they'd be pulling on different increments. I stopped taking photos after the novice class because as soon as the sun had a chance to shine on us over the hills, cloud cover came in and it was just too cold. I helped on the cart along with a good team of others and as timer on occasion. Sebastian did well on his first pull and I passed him a round, so that his next pull was 1050. Cinnabar of course did great on his first pull of 900 and I passed him a round, so that his next pull was 1200. I was giving Sebastian alot of mom time as soon as he was called "in the hole" (they call the dog who's up, who's on deck, and who's in the hole). He got back rubs, hugs and kisses. This worked at the last pull, so I wanted to see if it would work again for my ADD (attention deficit disorder) boy. He started his 1050 pull well and then of course, the train was near and started tooting its horn. (It didn't toot for anyone else the entire day - Murphy's law). 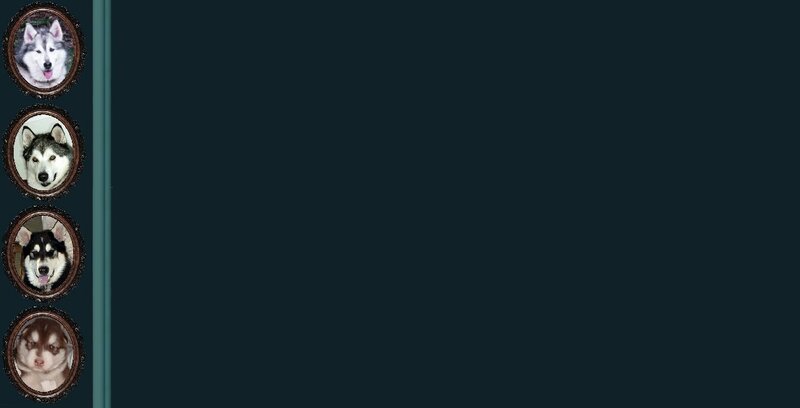 It briefly got his attention, but I got it back miraculously and he pulled in just under 15 seconds. I passed him once so that his next pull was 1350. 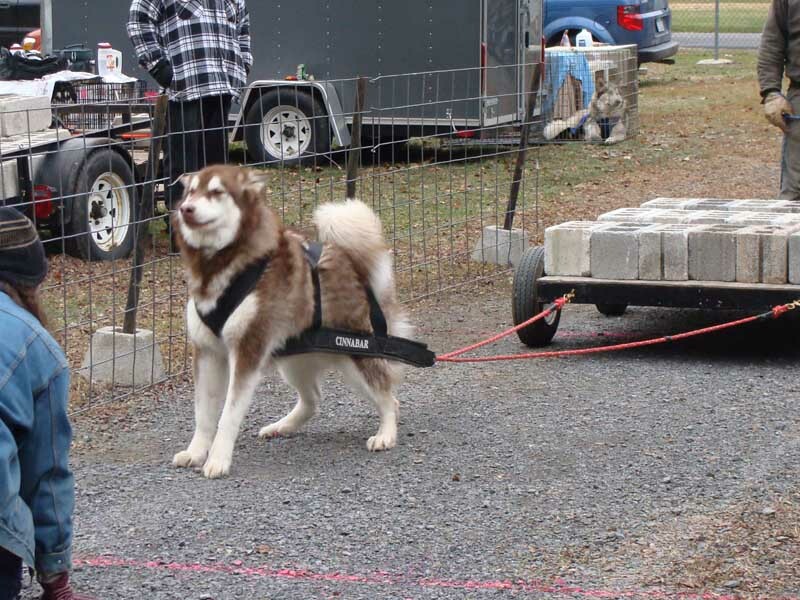 I saw that even the big dogs were having trouble getting the cart started on the gravel, but didn't think it would affect Cinnabar at that weight (1200). I wasn't thinking, some good dogs got knocked out because of that. Cinnabar came up, raring to go and gave it a good shot. He was digging in, but needed to dig in even more. He never gave up, and I went side to side with him. As I saw him start to get frustrating, I asked for a push when he started again, they gave a light push and he damn near pulled the cart into the river :) In hindsight, I should've had the cart moved slightly before he pulled so that he didn't get caught where others had. 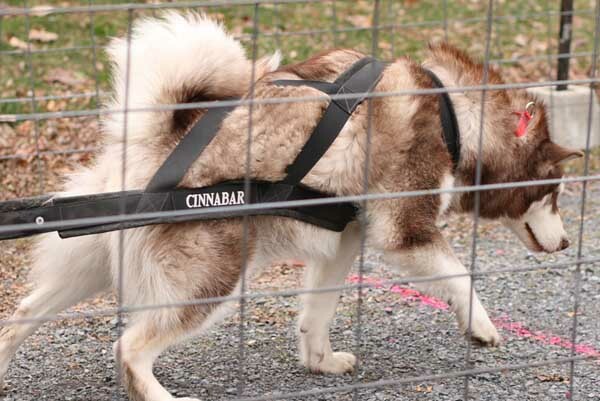 So, surprisingly, Cinnabar finished with 900lbs, but also surprisingly got a first place because he was alone in his class (125 lbs). The cart was moved for the next round and Sebastian just blew it away at 1350. I didn't pass him at all, so that his next pull was 1500. He was started to be a baby in pulling out the line taut, so I spent time in the chute getting his focus back. He then also blew that away. 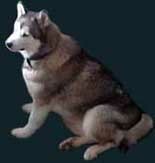 At this point there were just 5 left in the competition (Pudge/Bulldog, Harley/St Bernard, Raider/Malamute, Dozer/Presa and Sebastian). His next pull of 1650, he heard a noise to his right. I had trouble getting his focus back. I made funny noises, did a dance and generally gave the crowd lots of entertainment. He was mildly interested in me, but his interest was perking up. We were timing out and he made an attempt which I encouraged them to push so that he did end on a positive. He ended up with 1500 lbs, but surprisingly got 2nd in his class because he had competition for a change. Pudge was also gone at that weight. Raider pulled great!! He did several more rounds. He has a great "walk it off" style. His first time pulling since Harrisburg, and he is looking very good. Harley did well, but he also surprisingly got caught on the gravel, and just missed out getting best body percentage. Dozer, the big Presa ended with most weight pulled at 2400 lbs. Action Jackson (pit), got best body percentage. This dog just started pulling about 3 months ago and is a natural. 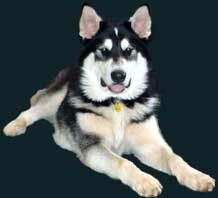 His handler is doing an excellent job talking him through his rounds when he gets into trouble. It started warming up a little about an hour before the pull ended. It took me about two hours to warm up once I got home, and then to the boys' delight we got a light snow. They had a great day in that weather!!! Although this was a tough track, it was a good day for learning. 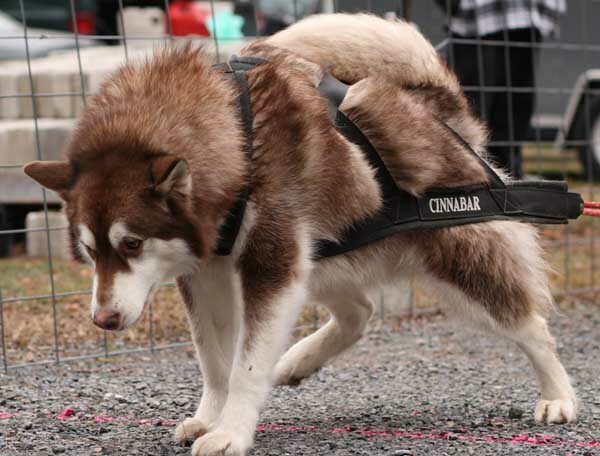 I've got to think more about moving the cart for Cinnabar if I see other dogs in trouble on this kind of track, and the cart has not been moved. I also got confirmation with Sebastian that more mom time works for him. After looking at the numbers, even though they were lower than I expected, we had a good day. Sebastian weighed in at 145 and pulled 1500 pulling 10.34 times his weight, so he got his final leg toward his WWPD!! (4 pulls over over a combination of either 8 times their weight on natural surface or 12 times their weight on manmade surface).